On the subject of William Howard Taft and Christmas, more than a few presidential historians have likened the large, jovial Taft to a Santa Claus-like figure. Few would deny that the burly Ohioan was a warm, generous and good man, but it was this very nature which made him a relatively ineffectual politician and led to a mostly forgettable presidency, which avoided any major catastrophes, other than the political ones inflicted on Taft’s party and his electoral career. The first mention of Taft as a public figure and Christmas dates back to his time as the military governor of the Philippines. Taft held the office during a period of civil strife and battling factions, in the aftermath of the Spanish-American War. Each year, leading up to the winter holiday, Taft would review the long list of military and political prisoners and issue pardons or reduced sentences to those individuals he deemed most deserving – and with the prisons badly overcrowded during this violent period, perhaps some not quite so deserving. The most famous and controversial of these instances of clemency was in the case of a priest who had buried alive the leader of the war-torn city of Taylay during a violent uprising. Taft reduced his death sentence to 20 years in prison. When Taft prevailed in the election of 1908 with very little support from the South, he intentionally chose the city of Augusta, Georgia for the location of his family’s Christmas vacation. President Taft wanted to show that he would represent the interests of all Americans. 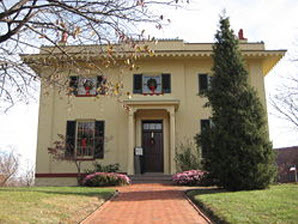 His family spent part of their time at the residence of a Mr. Hack, a prominent supporter of William Jennings Bryan, whom Taft had defeated a month earlier in the presidential election. Mr. Hack presented the Taft family with a native holly tree as a gesture of goodwill. The evergreen mistletoe on the tree was said to represent a much hoped-for era of good feelings between the political parties and the regions. In a letter to his sister-in law, Taft wrote that the family was greatly enjoying their stay in Georgia, complaining only that his children hardly spoke and when his wife Nellie spoke, it was generally to criticize his efforts at cabinet-making. He also commented that Nellie had adapted much better and was far more enthusiastic than he to have become a part of Washington’s elite political society. It was often commented that Nellie was the one who convinced Taft to accept Teddy Roosevelt’s support and pursue the presidency in 1908, as opposed to accepting his own preference – an appointment to the Supreme Court. During his time in office, Taft’s famously generous nature was apparent in the scope and number of Christmas gifts he sent out. The president believed more in the act of giving than in the essential value of the gifts themselves. As did not limit his gifts to family and friends, his Christmas list often climbed into the hundreds. He would send out presidential Christmas cards to accompany the gifts. Oftentimes, his aides would have to scramble to acquire more White House cards as the list grew to ungainly lengths. Mr. Taft would usually devote several days of his own time to going Christmas shopping from store-to-store. Among his favorite items to send were books and jewelry, and he always made his own selections. On each of the books he sent, he would write a personal sentiment inside the cover, lending these objects a lasting historical value. In addition to friends and relatives, President Taft presented Christmas gifts to all of the White House clerks. He also sent a Christmas turkey to all married White House employees – usually just over 100 turkeys for a total cost of $350 – $400. He would also give a personal holiday remembrance to each of the Secret Service men assigned to protect him. The Taft’s were also the initial First Family to display the White House Christmas tree and hold the presidential Christmas party in the Blue Room, a location previously considered sacred to official entertaining. Previous trees and holiday celebrations held by Grover Cleveland and Theodore Roosevelt had been held in the Upper Corridor, a less-formal living room-like chamber in the executive mansion. The childhood home of President William H. Taft. Decorated for Christmas, it is a National Historic Site. William Howard Taft was born September 15, 1857. He spent his first Christmas at his family’s home in Cincinnati, Ohio. His father, Alphonso Taft, had been Secretary of War and Attorney General under president Ulysses S. Grant in 1876-77. Taft attended Yale University where he graduated second in his class in 1878. He went on to law school and was admitted to the Ohio bar in 1880. Taft entered Republican politics and held several minor appointive offices in Ohio until 1887, when he was selected to serve out the unfinished term of a judge on the state Superior Court. The following year, he was elected to a five year term in the same position. For his next eight holiday seasons, he served as judge on the US Sixth Circuit Court of Appeals, where some of his decisions drew the ire of organized labor. He upheld the right of workers to organize, join a union, and to strike; but he also upheld the use of an injunction to stop a strike by railroad workers, and declared the use of a secondary boycott to be illegal. In 1900, President William McKinley appointed Taft to the chairmanship of the Second Philippine Commission. It was his responsibility to organize civil government in that country following the Spanish-American War. Taft impressed everyone with his administrative skills and was appointed the first civilian governor of the Philippines in 1901. In addition to his aforementioned Christmas time clemency, he concentrated on economic development and was well-loved by a majority of the native population. Taft took his role so seriously that, when offered by President Theodore Roosevelt, he twice refused appointment to the U.S. Supreme Court, a role which he also coveted greatly. In 1904, he agreed to return to Washington as Roosevelt’s Secretary of War. Impressed with his work in the Philippines, Roosevelt and Taft became fast friends, with the President soon coming to think of his portly, amiable, and cerebral advisor as his natural successor. When he declined to run for re-election in 1908, Roosevelt publicly threw his support to Taft. Though he often decried politics and his ultimate ambition was now the Supreme Court, his wife, Helen Herron Taft, got her Christmas wish when her husband agreed to seek the nation’s highest office, and she would end up being a trusted advisor and confidant to her husband when he attained it. Taft went on to easily defeat perennial Democratic challenger William Jennings Bryan 52% to 43% in the popular vote. He carried the Northeast, Midwest, and most Western states, while Bryan was solidly favored by Southern voters. Some of the major events which occurred during Taft’s presidency were the establishment of the federal income tax, the Postal Savings Bank Act (which, under federal supervision, allowed one bank in each state to offer 2% interest on accounts under $500), the establishment of an eight hour workday for federal employees, and passage of the Panama Canal Act (which exempted US coastwise shipping from paying canal tolls). 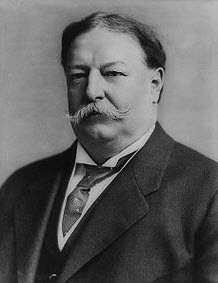 Taft also appointed five Supreme Court justices, tying for the third highest total among all United States presidents. Once in office, the originally progressive Republican aligned himself with some more conservative elements of the party. Taft did, however, institute a number of policies which were pro-worker and pro-small business and aimed to keep the largest companies regulated and their power in check. He obtained an injunction to prevent western railroads form raising freight rates, and the executives at Standard Oil and American Tobacco probably didn’t send Christmas cards to the White House after the Supreme Court found them to be in violation of the Sherman Antitrust Act and ordered the dissolution of their corporations. But Taft’s presidency was marred by and is most noted for the feud which began between him and Roosevelt shortly after he took office. The widening rift continued throughout his term, splitting the Republican Party and causing his former mentor’s departure and formation of the Progressive, or “Bull Moose” Party, leading to Democrat Woodrow Wilson’s victory and large Congressional losses for the Republicans in the 1912 election. The bad feelings began with the passage of the Payne-Aldrich Tariff Act – a highly protectionist measure which angered Roosevelt and the more free-trade oriented progressive wing. They continued when both men were said to slight each other after Roosevelt returned from a trip to Africa. The feud intensified in 1911 when Taft attempted to reach controversial trade deals with Canada, Britain and France, and came to a head later that year when Taft filed suit against U.S. Steel for violation of anti-trust laws. In the suit, he alleged that when he was president, Roosevelt had acted improperly when he allowed the steel giant to purchase the Tennessee Coal and Iron Company. It is safe to assume that the president and his former mentor did not exchange presidential Christmas cards or Christmas gifts in 1911. Spurred on by progressives, Roosevelt announced his candidacy for the 1912 Republican nomination, and the two men attacked each other relentlessly throughout the primaries. Since Taft’s supporters controlled the convention, he was able to outmaneuver Roosevelt for the nomination, at which point Roosevelt left the Republicans and along with his supporters, founded the new party and continued his campaign. But neither would experience another White House Christmas, as the split resulted in the first Democratic victory in 20 years and the first and only time a sitting president would finish third in his bid for re-election. The eight electoral votes Taft had won were also a record low total for an incumbent. Chastened by this political disaster, Taft returned to Yale, where he became a professor of Constitutional Law. After the United States entered World War I, he served on the National War Labor Board and in the war’s aftermath, he strongly supported the formation of the League of Nations and encouraged deep American involvement. The vitriol between Taft and Roosevelt subsided and the two were on speaking terms again by the time of Roosevelt’s death in 1919. In 1921, Taft began the happiest period of his public service career when President Warren G. Harding appointed him Chief Justice of the Supreme Court. He quickly set about the task of increasing the efficiency of the court, which had fallen behind in its work and had its profile diminished in recent years. He was instrumental in getting the Judge’s Act of 1925 passed. This Act gave the court greater discretion in choosing which cases it handled, allowing it to focus more on issues of national importance, particularly those involving Constitutional questions. The court’s most influential decision under Taft’s leadership was in the case of Myers v. United States (1926), which upheld the authority of the president to remove federal officials. Superb post,I recently subscribed to your rss feed. Wow, I just learned so much! thank you for the insightful post! He grew up in a pretty nice house as a kid. I doubt he knew he would be living in an even nicer one when he grew up!